Angelique Kerber becomes only the second defending U.S. Open champion in the professional era to lose in the first round. NEW YORK — The question was rather simple after Angelique Kerber became only the second defending U.S. Open champion in the professional era to lose in the first round. The surprisingly lopsided 6-3, 6-1 loss to 45th-ranked Naomi Osaka of Japan under the closed roof in Arthur Ashe Stadium at a rainy Flushing Meadows on Tuesday was former No. 1 Kerber’s latest in a long list of disappointing performances in 2017, so she was asked what she thinks went wrong this season. Talk about an understatement. In 2016, Kerber broke through to the top of tennis in a spectacular way. A player with only one previous Grand Slam semifinal appearance reached the first three major title matches of her career, winning two of them: She stunned Serena Williams in the Australian Open final, lost to Williams in the Wimbledon final, and then beat Karolina Pliskova in the U.S. Open final to rise atop the WTA rankings for the first time. Her follow-up has been quite a flop. Kerber, a 29-year-old German, hasn’t won any title of any sort this season. She is only 25-18 overall, 0-9 against opponents ranked in the top 20, and Monday’s loss assured her of falling out of the top 10 for the first time since October 2015. At Grand Slam tournaments she is 6-4, including another first-round loss in May at the French Open, where she became that tournament’s first No. 1 seed to lose so early. “I know that I’m strong and I know that I will come back stronger, for sure. 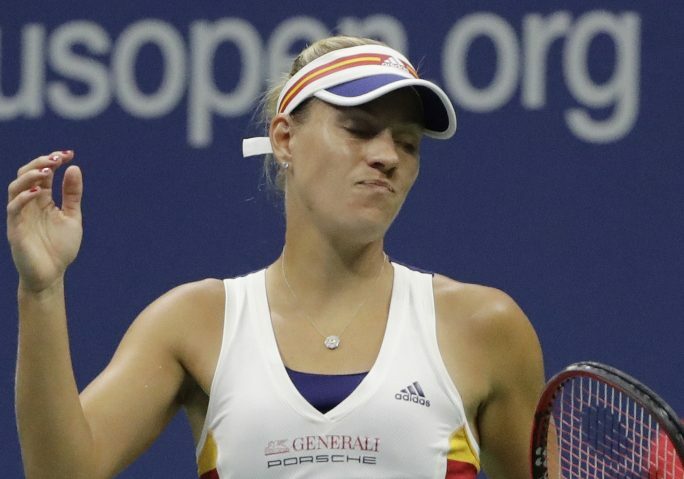 I know that I will not (be) giving up,” said Kerber, the first defending champion to lose in the U.S. Open’s first round since Svetlana Kuznetsova in 2005. Showers showed up before noon Tuesday and led to the postponements of dozens of matches. The only court used in the afternoon and evening was Ashe, which has a retractable cover. Pliskova, who is seeded No. 1, easily advanced by beating Magda Linette 6-2, 6-1, French Open champion Jelena Ostapenko got past Lara Arruabarrena 6-2, 1-6, 6-1 in a match that started on Court 17 then was moved indoors at Ashe, and No. 23 Barbora Strycova defeated Misaki Doi 6-1, 6-3. Yet another seeded woman was eliminated when No. 28 Lesia Tsurenko lost to Yanina Wickmayer 6-3, 6-1. At night in Ashe, No. 15 Madison Keys beat Elise Mertens of Belgium, 6-3, 7-6 (6). The only men’s matches completed were at Ashe, where No. 1 Rafael Nadal overcame a first-set hiccup before overpowering Dusan Lajovic 7-6 (6), 6-2, 6-2. Nadal’s possible semifinal foe and chief rival for the title, Roger Federer, outlasted Frances Tiafoe, 4-6, 6-2, 6-1, 1-6, 6-4. Kerber’s exit further thins the women’s bracket, which was missing 23-time major champion Serena Williams to begin with because she is expecting a baby. Three of the top seven seeded women were gone before dinnertime on Day 2, with No. 6 Kerber joining Monday’s losers, No. 2 Simona Halep – beaten by Maria Sharapova in her first Grand Slam match since a 15-month doping suspension – and No. 7 Johanna Konta. While Kerber’s quick departure was stunning in and of itself, that Osaka would be the one to do it might not be quite so remarkable, even if she is just 19 and never won before against a top-10 woman. Osaka is comfortable around the grounds at Flushing Meadows, where she has been spending time, and even occasionally practicing, since she was a kid: She was born in Osaka, Japan, so represents that country, but moved to the U.S. when she was 3, has dual citizenship, and used to live on Long Island.